In my dream, I was driving next to my grandfather, who is long dead now. We saw two tornadoes forming. I told my grandfather we need to get out of here. He told me to let nature run its course. So, we were driving. I pulled out my phone and called my dad. He told me there had been another outbreak. Of zombies. Boom. Suddenly, I was at some store with my uncle and aunt. He was arrested for theft, even though I know he didn’t do it. Then, the officer walked up to my aunt and told her that he was innocent. I step outside. Huge tornado right in front of my face. I started to run. And run. And I didn’t stop running. All of the people in that store were killed. I saw a person driving away from zombies. I started yelling at them to stop. “What the hell?!? You are going to let me die?” I screamed. I started to run, but was teleported to my bed, in my house. All of the people from my dream appeared in front of me. I started to tell them all my secrets. Part of my wall blew off and zombies ran into the house. Everyone was sucked in or eaten. The dreamer is driving, which can symbolize movement in his life. We are said to “go places” in our lives when things are humming along, or get “stuck in place” when our lives are stuck. What better way to symbolize those ideas than with driving a car? It can also symbolize movement (or lack of it) in a particularly area of life. So immediately I think to myself that this dream might be about something the dreamer is trying to accomplish. Next we get into the zombie imagery. That’s a clue that zombies are somehow involved with the subject of the dream. Zombies in dreams can symbolize the “walking dead” and that imagery fits many situations in life. I’ve interpreted several dreams about zombies that relate back to the dreamers’ perceptions that they live in a world of the “walking dead,” or that they themselves fit into this category of being alive but dead inside, or at least inactive and sluggish. But in this dream the zombies are related to something the dreamer is trying to accomplish, as you will see in a moment. Now consider the tornadoes. By itself a tornado in a dream has a variety of possible interpretations. It can describe something going on in your life that’s comparable to a whirlwind. Frantically getting ready for the holidays is a situation described as a “whirlwind” of activity. A tornado can also describe an inner state of turmoil, or a tumultuous relationship or situation. There are other possibilities related to anything that goes round and round. 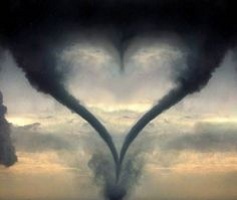 This dream gives a big clue to the meaning of the symbolism being used by showing two tornadoes. The part that might connect this dream with your life is the two tornadoes. I wonder if maybe you have two projects going furiously at once, or two areas of your life that are very active, something like that. In which case your grandpa’s advice to let nature run its course could apply to something you’re working on right now. Judging by the presence of the zombies, maybe you’re working on a new book or two? If so, maybe the part about being left behind expresses the feeling that you want to abandon one of the projects? Wow, basically everything you said is true. I am working on two different books, and am considering [stopping] one of them. Thanks. The author, knowing his heart isn’t into writing one of the books, is told by this dream it’s better to drop one of the projects so he can put his fullest effort into the other one. He’s having difficulty though because he believes in finishing what he starts, as symbolized in the scene when a character drives away, leaving behind the dreamer to presumably get mauled by zombies. The dreamer’s strong reaction (“you’re going to let me die? !”) expresses his feelings about abandoning one of the projects, speaking from the perspective of his creative idea. He has to allow one of the projects to die. I think the dream is telling him that it’s wise, and showing him why he hasn’t done it already. For more dream interpretations, visit RedditDreams.com. I’m RadOwl. 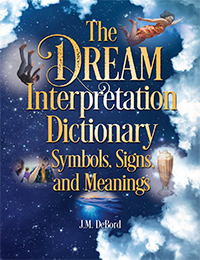 To learn more about my groundbreaking book about dreams, visits dreams1-2-3.com. Next story Dream about leg amputated – What does it mean?